Bethesda Softworks is a popular video game developer and publisher founded in 1986. One of their latest games is Fallout 76, the newest version of a 2008 game, which received mixed reviews, mainly due to the numerous bugs and absence of NPCs (non-player characters). We have gathered gamers’ complaints, and the Bethesda most frequently asked questions as posted on the Pissed Consumer site, and answered users’ top 12 concerns. How do I contact Bethesda customer support? Why do I get the "this operation cannot be completed” error when I try to download Skyrim mods to my Xbox? When will I receive my pre-ordered Fallout 76 Power Armor edition package? How do I get my Fallout 76 Power Armor Edition nylon bag replaced with canvas bag? My power armor is invisible and won’t come off when I play Fallout 76. What should I do? How do I get a refund for my pre-ordered Fallout 76? How do I link my Bethesda account to my Xbox One? What can I do about my Fallout 76 constant crashes? Does Fallout 76 have mods? My Elder Scrolls 5 stopped saving new games. How can I fix this? What is the storyline in Fallout 76? Below is the comprehensive list of the most asked Bethesda consumer questions, based on the Bethesda complaints and questions posted on Pissed Consumer. 1. How do I contact Bethesda customer support? This was one of Bethesda consumers’ top questions. Although this might sound like a pretty easy question to answer, it is nowhere near easy. To find Bethesda consumer support contact details is quite challenging given that there is no way to communicate with a company agent, according to what information is available on the Bethesda official website. Instead, you need to choose one of their products, and create a ticket; no Bethesda customer help center information for direct communication, though. However, Pissed Consumer has managed to find and collect all available Bethesda Softworks customer service details, including a Bethesda contact number. The Bethesda Games Studio Facebook page seems to be unavailable at the moment of this writing. There is also a Twitter account (of a Bethesda branch entity) that provides service updates and support. 2. Why do I get the "this operation cannot be completed” error when I try to download Skyrim mods to my Xbox? There is no information about this issue on the company’s official site. However, according to a Reddit discussion board, it is a Bethesda Fallout 76 issue, and you need to wait until they fix the error. Another forum provides more practical details. There is a chance the issue you are facing has to do with you having ghost space. In this case, you could clear your reserve space. 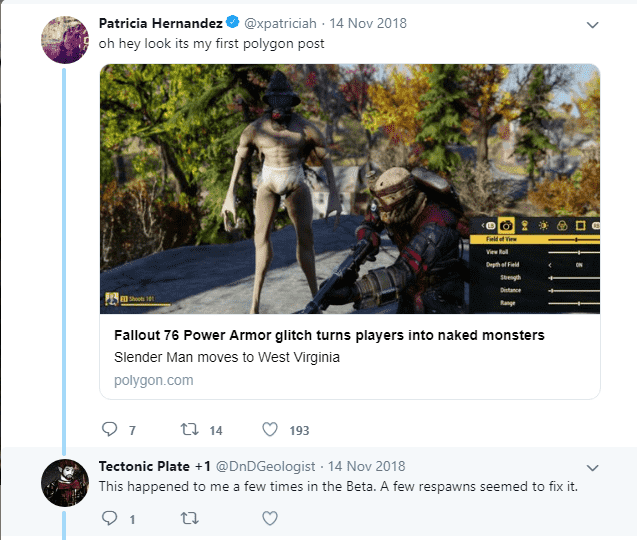 Be prepared to lose Fallout 76 mods that are no longer on the site, though. If you haven’t downloaded any big-data mods, you can restart the game and try downloading it again. To restart the game effectively, a forum participant recommends to either start up your Xbox after you leave it alone for 30 seconds, unplug it, plug it back, and press the power button or hold the power button for 10 seconds. 3. When will I receive my pre-ordered Fallout 76 Power Armor edition package? According to the Bethesda store, you will be sent your pre-order BETA codes, which is part of the package, the Monday or Tuesday following your order. Creating a Bethesda.net account (use the same email you typed in when you made the pre-order). Signing in to your Bethesda.net account (use the same ID you used to play the B.E.T.A.). 4. How do I get my Fallout 76 Power Armor Edition nylon bag replaced with canvas bag? There was considerable frustration expressed on Twitter from consumers that had ordered the Fallout 76 Power Armor Edition because instead of the advertised Bethesda canvas bag, they received a nylon alternative. To compensate consumers, the company agreed to give 500 Atoms to those that didn’t receive what they paid for. 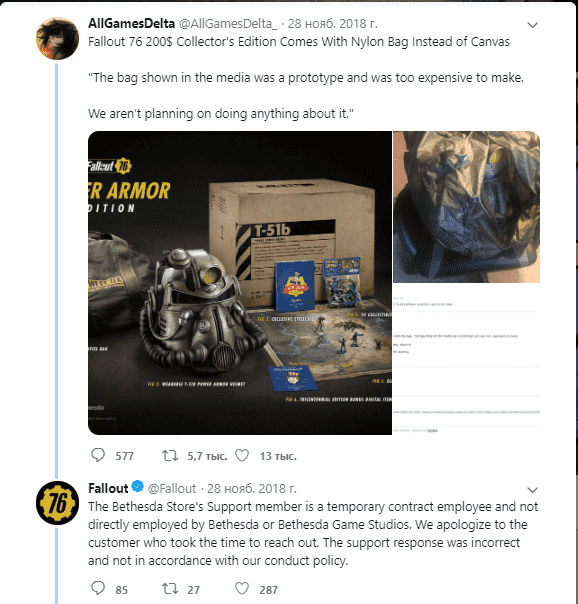 Their next step was to actually send canvas bags to those that purchased the special edition of the Fallout 76 game. 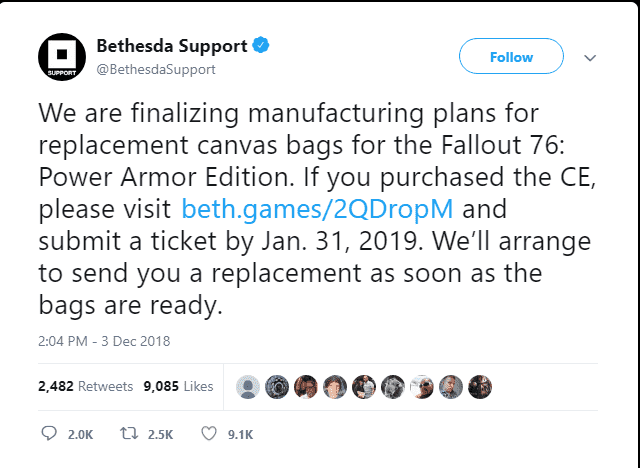 According to a tweet they posted, if you wish to receive your canvas bag, you need to visit the Bethesda сustomer help center and submit a ticket by January 31, 2019. As soon as the new, canvas bags are ready, you will be sent your replacement. 5. My power armor is invisible and won’t come off when I play Fallout 76. What should I do? It appears that this was one of the Fallout 76 glitches that troubled Bethesda developers last year. According to a player who had the same issue, it seems that a few respawns would fix the problem. 6. Is Fallout 76 online only? 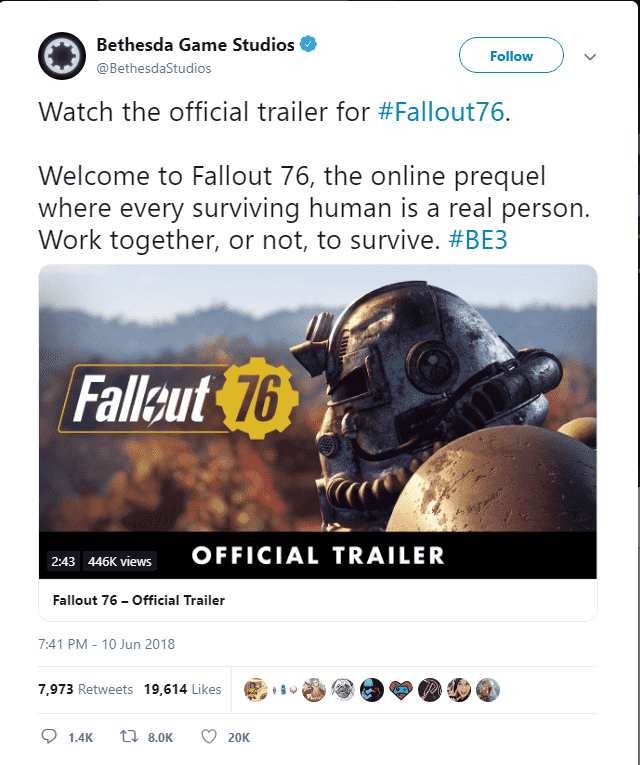 According to a Bethesda tweet, Fallout 76 is an online-only game, with no single-player experience or NPC’s. This means that what players can do, is choose whether they want to play with or without teammates while sharing a server with others (switching to a private server is not an option). 7. How do I get a refund for my pre-ordered Fallout 76? Based on the replies posted on the Bethesda community page, you can claim a refund by visiting the Bethesda support center (for Bethesda.net) or the Bethesda customer assistance page (for gear.bethesda.net). 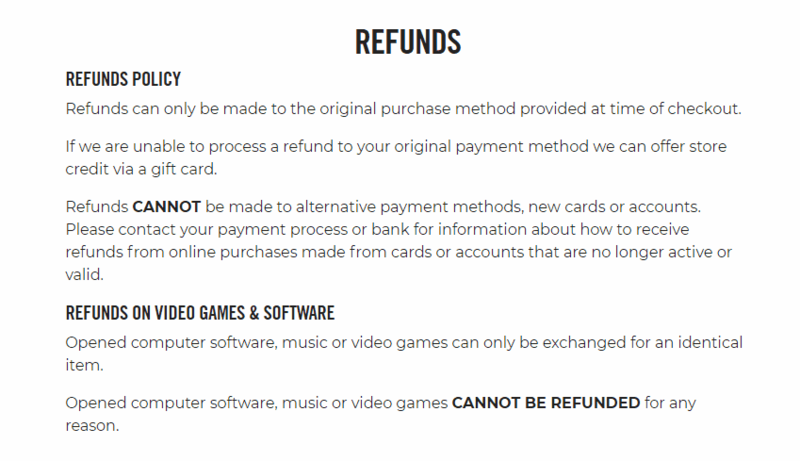 The gear.bethesda.net refunds policy found in Bethesda Softworks FAQ clearly mentions that refunds cannot be provided for products that have been opened (i.e., video games or computer software) and that refunds will be made to the purchase method offered when you finalized your purchase. 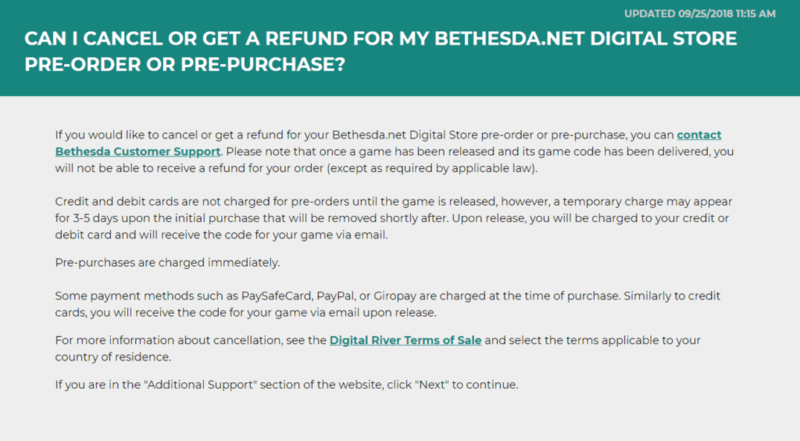 Note that refunds are not available for game codes that have been delivered according to Bethesda support. 8. How do I link my Bethesda account to my Xbox One? Select the Mods option from the main menu. Log into your Bethesda.net account (or create one). After you complete this process, your Bethesda.net account will be automatically linked to your Xbox One Live account. 9. What can I do about my Fallout 76 constant crashes? Users that have been experiencing the same problem said that updating their video card fixed the issue. Check your system to see if it meets the minimum Fallout 76 requirements. Reset the GPU or processor to the specifications of the manufacturer if you are opting for Turbo Boosting/Overclocking computer hardware. 10. Does Fallout 76 have mods? Indeed. According to PCGamer, there are about a dozen of cosmetic mods available even in beta mode, ranging from bobby pins and giving characters odd hair colors to retextures of the fishing hat while also including a mod that allows players to switch the menu music with an acoustic guitar version, and show a collection of cinematic shots from the live-action trailer. 11. My Elder Scrolls 5 stopped saving new games. How can I fix this? Go to your Saves file on your computer and opt for “Clear” or “Move content” options. Save your new game – it will be your Number 1 save now. 12. What is the storyline in Fallout 76? This question along with the question "Does Fallout 76 have a storyline?" is one of the most popular Bethesda Softworks FAQs. According to the very first game storyline, it took place a little over 80 years after the world had been destroyed by a nuclear war and described dystopian ruins of the United States. Fallout 2 Fallout 3, Fallout New Vegas and Fallout 4 took place during the following 200 years after the bombs had dropped. The latest Fallout game: Fallout 76 is the earliest game in the Fallout timeline. Previous games mentioned one of the earliest bunkers -Vault 76. It was opened in 20 years after the nuclear bombs dropped. Fallout 76 players will see the world ravaged by the aftermath of nuclear war as the first survivors of the Great War. These first survivors will start rebuilding society. According to Pete Hines, the vice president of Bethesda Softworks, told in his interview with GameSpot that the Fallout 76 does have a main campaign. "There definitely is a story in this game...What happened to the people outside after the bombs fell? Where are they? What are the new threats? How do you solve that?" In the game you'll be given a series of quests, directing you to explore the wasteland and these quests will guide you through the particular areas of the map. 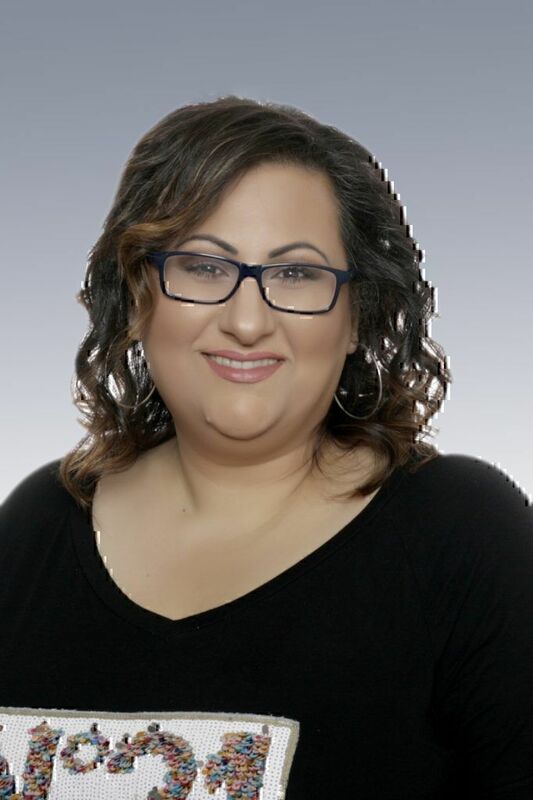 If you have a question that has not been answered above, you may leave a review or ask a question so other consumers that had the same issue can reply to, with ways they got their problem resolved. More than often, a company rep also provides an answer too. Before you do, though, we suggest you read the Bethesda Softworks reviews first to see if other users have the same complaint and whether a solution has been proposed to them.